An award-winning swimmer with a national and international perspective on giving back. A Russian Studies major whose love of languages has brought students together from across disciplines. A hockey star dedicated to exposing her love of sport to children of all ages. An international student eager to share his culture and community with others. A future nurse who's taken personal tragedy and transformed it into triumphant success in helping cancer patients. That's just a short glimse at the five students receiving Dalhousie’s top honour in student life: the Governors’ Award. The Governors' Awards, which will be presented at tonight’s Dalhousie student IMPACT Awards ceremony in Halifax, recognize exceptional contributions or leadership in the extracurricular realm in such areas as university governance, development of a sense of community on campus, community service, internationalizing the campus, visual or performing arts, minority access or athletics. Nominations come from across the Dal community, with the recipients chosen by a committee consisting of Dalhousie's president, three Board of Governors members and the vice-provost student affairs. We spoke to all five of this year's winners about their activities, their achievements and what drives them to make such a difference in their community — on campus and beyond. Hasmeet Singh Chandok says that racism isn’t quite the right word to describe some of the negative experiences he and his brother have had since moving to Canada from India three years ago. With that in mind, Hasmeet founded the Sikh Student Association at Dalhousie in 2013 shortly after starting his master’s degree in Computer Science. Through the group — the first of its kind in Atlantic Canada — he and others have helped to raise awareness about Sikh religion and culture, in part through arts and dance performances at community. Last fall, Hasmeet used the group as a springboard to collaborate with refugee support group United for One and the Immigrant Services Association of Nova Scotia (ISANS) to help raise money to bring Syrian refugees to Nova Scotia. Hasmeet played a central role in organizing the fundraising dinner, which saw 400 people from various faith communities pledge $200,000 — zooming past their original $160,000 goal. “That was a really big moment for me,” he says, noting the applications for the refugee families are now being reviewed by Citizenship and Immigration Canada. Once the families arrive, he says a support group will be set up at a local mosque to offer help to the families as they get settled and adjust to life in Nova Scotia. That’s familiar territory for Hasmeet, who has played a significant role in welcoming and helping new students adjust to life at Dal through his role as vice-president of the Indian Subcontinent Students Association (INDISA), the Sikh Student Association and as a volunteer for the International Centre’s New Student Assistance Program. Through the latter, he helped students with such practicalities as finding housing and setting up bank accounts. Hasmeet has also won praise for contributions he’s made within his own Faculty. He’s helped organize the annual Dalhousie Computer Science In-House Research Conference (DSCI) for the past three years and was awarded the CS Citizenship Award in 2015. Undergraduate students also showed their appreciation for Hasmeet’s leadership and enthusiasm by awarding him the Teaching Assistant Excellence Award last year. Hockey has been a gateway to many opportunities for Sarah MacNeil, but cartoons almost derailed it all when she was just starting out in the sport at age six. All these years later, Sarah is doing her part to help encourage children feel comfortable starting out in the sport. This winter she volunteered as a trainer with Bauer’s First Shift program, which aims to break down barriers for new-to-hockey families and ensure children leave the rink feeling positive. Her own abilities on the ice served as an entry point into varsity sport at Dal, where she has been an integral member of the Dal Tigers women’s hockey team for five years. Sarah, a forward, ascended the ranks during her time with the Tigers, competing in the Canada Games along the way and then serving as assistant captain the past two seasons. An injury forced her onto the bench for the last games of her final season, but her role has always stretched far beyond what happens on the ice. The four-time Academic All-Canadian has been a liaison between the team and the broader community over the years, coordinating outreach activities such as holiday gift donations to the North End Parent Resource Centre and other charity initiatives. Sarah has also worked to promote inclusivity in hockey by volunteering for Courage Canada Hockey for the Blind and the Easter Seals sledge hockey program. That commitment to the broader community has made her a great fit for Recreation Nova Scotia as well, where she’s been a board member since 2014. For all her efforts, Sarah has received the Atlantic University Sport Community Service Award for women’s hockey not once, but twice (2015 and 2016). Last summer, when Jeremy Ryant was awarded a Queen Elizabeth II Diamond Jubilee Scholarship to work with an international NGO in Uganda, his first phone call was to his parents. His second was to his Tigers swim coach, Lance Cansdale. Through various connections, Jeremy — an Atlantic University Sport (AUS) all-star, nine-time AUS medalist and four-time Academic All-Canadian — was able to hook up with the Kampala Seals swim club in Uganda’s capital city. He was not only able to maintain his pool regimen while working with the Food Rights Alliance on food security issues, but made amazing friends and gained new perspective on what it means to be a student athlete. That realization explains why the Winnipeg, Man. native — a Political Science honours student with a minor in International Development Studies — returned to Halifax even more committed to the community outreach and engagement experiences that had shaped his first three years at Dal. 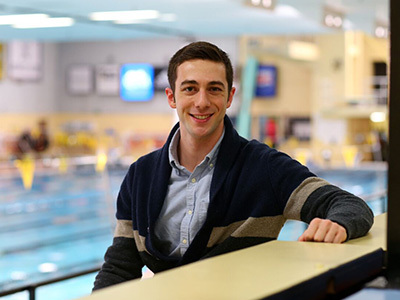 As the current president of Dalhousie’s Varsity Council, Jeremy works with his fellow Tigers to find ways to give back to sport and the broader community. He leads by example, too, organizing the Tigers’ Movember campaign, co-founding the Healthy Tigers Nutrition Initiative and serving as vice-president finance of the Special Tigers Society, which works with youth with intellectual disabilities. This year, Jeremy’s efforts were recognized with community service awards from both Canadian Interuniversity Sport and Atlantic University Sport. 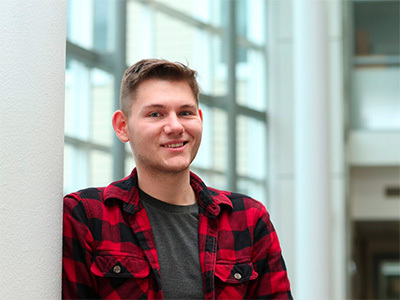 At the same time, he’s continued to work hard in the classroom: a dean’s list scholar, Jeremy just completed his honour’s thesis on the Canadian federal cabinet and is planning to attend law school next year. No matter where his path takes him, though, he expects he’ll always be seeking out the nearest pool. “I’ll be swimming for the rest of my life, until the day I die,” he says. For Aaron Taylor, fourth-year Russian Studies major, there are few things more fun than speaking in different tongues. Aaron, originally from Debert, N.S., can speak seven languages fluently: English, French, Russian, Dutch, Spanish, Icelandic and Mandarin. He’s not only president of the Dalhousie Undergraduate Russian Society, but chair of the Dalhousie Undergraduate Chinese Society, vice-president of the Dutch Society and responsible for helping launch Dalhousie’s first Language Council. Russian has been a particular passion for Aaron since he first saw the language’s characters in print as a kid. Russian Studies at Dal allowed him to dive deeper into appreciating the country’s language and culture — never more so than when he served as group leader for students from across Canada on a study-abroad semester in St. Petersburg. Aaron’s leadership has transformed the Undergraduate Russian Society into one of the largest, most vibrant societies in the Faculty Arts and Social Sciences. Its membership has increased from four students to more than 60, hosting events like Russian Night, Russia tea parties and Ukrainian Easter egg workshops that attract students from across different programs. That same drive to bring people together inspired Aaron to help create the Language Council earlier this year: a forum for the various language-focused student societies to gather, share ideas and find new ways to collaborate. Aaron also works as an employer relations coordinator with the Career and Leadership Development Centre and as a campus tour guide. Long-term, he hopes to work in the public sector — a position at the Canadian embassy in Moscow would be a “dream job” — but next he plans to complete his master’s degree at Carleton in European, Russian and Eurasian Studies, building on his honour’s research in Russian/Canadian arctic issues. He co-founded a student society for that, too: the Dalhousie Arctic Society, a multidisciplinary society inspired by a presentation he did with Health Promotion student Christie Silversides at the Canadian Conference in Student Leadership. Third-year Nursing student Maike van Niekerk knows just how important a helping hand can be in times of difficulty. As a teenager, she lost her mother to breast cancer. She says she’ll always remember the nurses who supported her mother along the way during treatments. “When she passed away, they came to her funeral and they still are kind of like surrogate mothers to me,” says Maike, who arrived at Dal from a small town outside Corner Brook, Nfld. in the fall of 2013. She credits those nurses — who she got to know during difficult trips to the oncology unit — for her decision to study Nursing at Dal. Maike has earned widespread media attention and acclaim in her home province thanks to a charity she launched in her mother’s name — Katrin’s Karepackage — that raises funds for cancer patients struggling with transportation to major centres for treatments and appointments. “A lot of people don’t even realize it is an issue, which makes it exponentially worse,” explains Maike, who biked 1,100-kilometres and ran seven consecutive marathons to raise awareness for the cause. Last fall, she enlisted the help of 350 of her fellow Faculty of Health Professions students as their annual “For the Health of It” fundraiser supported Katrin’s Karepackage. The funds allowed the charity to expand its efforts into Nova Scotia, something Maike says has resonated with cancer patients she’s worked with in the province. “They thought that it was incredible that people who are becoming health professionals are actually really advocating for their needs,” she says. That Katrin’s Karepackage has raised more than $100,000 to date speaks to Maike’s compassion and her ability to listen to the needs of others — a trait she’s put to frequent use over the past few years as a peer mentor and tutor to Nursing students and as a leader in numerous student groups and societies. Eager to broaden her understanding of her field, Maike took on a nursing internship in Nepal last summer. Inspired by the experience, she then proceeded to raise funds to purchase necessary school supplies for 600 kids in the country. Such efforts have earned Maike several awards and honours, including the Newfoundland Red Cross 2015 Young Humanitarian of the Year award. 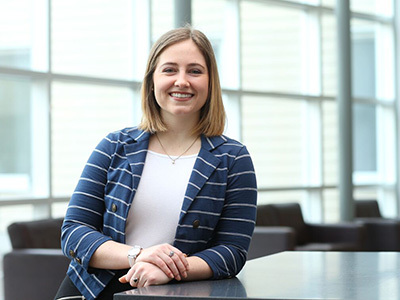 Maike says she’s had plenty of inspiration to feed off of since arriving at Dal, particularly from professors Kevin Duffy and Amy Bombay, with whom she has done research.